Valentino Šečić, a nine-year old boy, comes to the Day Center of the Vermont Youth Center in Brčko every day before his classes. 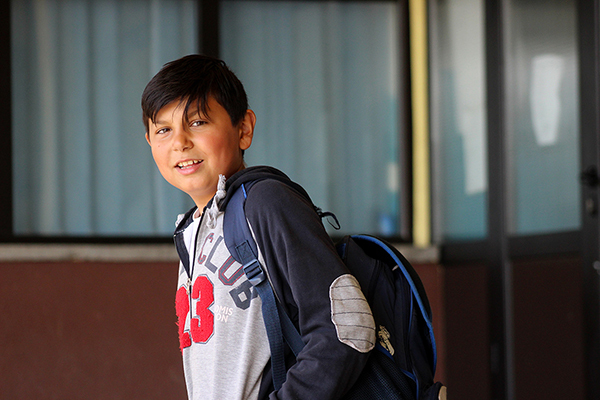 Due to health issues, he started school later than his peers, but with great determination, effort and support from the Day Center, he quickly fit in. “I am in the second grade, in the morning I come to the Day Center to study, hang out with friends, teachers help me with my homework if necessary, and they then take me to school", says Valentino as he takes part in an activity involving drawing and coloring hands. Valentino attends the Fifth Elementary School in Brčko and his favorites subjects are math, Bosnian language, and physical education. He says that one day he wants to become a police officer: "I want to put the bad guys off the streets. But first I need to be a good student and finish school." Ernestina Petrović, Valentino's teacher, says that he is among the top students in his class: “He has good grades; he is dutiful and active in class. He has a desire and motivation to succeed, he is persistent in everything he does." Valentino's two sisters, Vanesa and Samanta, both go to school. Their mother Azema says she is aware of the importance of education for her children and wants all three of them to take advantage of the opportunity she, unfortunately, was not given. Day Center for children at risk in Brčko has around 130 beneficiaries who enjoy the daily support of a psychologist, a classroom teacher, a social worker, a community mediator, and several volunteers. “We communicate directly with parents, we visit them, discuss the importance of education, and after our discussions, they often decide to include their children in the educational system. "So, besides Valentino, his two older sisters also attend school regularly” says Dobrila Vuković, the Day Center psychologist. Vuković adds that the Parent Support Program is of immense importance when it comes to children returning to school and school drop-out prevention. Importance of the Program has also been recognized by the European Union, which allocated EUR 350,000 for the project “Bright4All - Basic Right to Education for All Children in Bosnia and Herzegovina”, which is implemented by Save the Children in partnership with Vermont Youth Center and Žene sa Une Association from Bihać. As a part of the project, Local Action Research on the Scale and Causes of Dropping out of School was conducted, involving 1132 children from the Una-Sana and Tuzla Cantons, Prijedor, Bijeljina and the Brčko District. The Project and the Research conducted as part of it represent the continuation of activities that have been ongoing for several years now and will also serve as the basis for designing future activities. “It is especially important that local communities were directly contacted and involved. Both the community and the professionals should be heard. We have results, we are aware of the situation and based on that we have defined our specific goals, and the Brčko District inter-sectoral working group will create an action plan for the school drop-out prevention”, says Damir Radenković, director of the Vermont Youth Center. For Valentino and many other children, time spent in the Youth Center became an integral part of their lives. However, not all children have the same opportunity and access to organizations such as Vermont, and that is why all the stakeholders, beginning with the family and the NGO sector, need to be involved in the process of addressing the school dropout issue. "As for the system, I hope that Brčko will soon have a single list of children, which will be a simple way to link relevant institutions and monitor the situation in the field”, Radenković concluded.